I have been running my mill for two years now and today was pulling wood from the oak log pile. I get my logs from several people so not sure who brought this particular log. The bark appeared to be oak but when I cut into it it appeared to have a pecan like interior. I have cut pecan before and this doesn’t look like pecan to me. I will post pictures and see if anyone may know what it is. Thank you in advance. Absolutely beautiful! I’d guess pecan. Boy, that looks really familiar… I don’t think it’s pecan though. You’ll need to take some better pictures. Close ups of the Heart and sap wood and clean end grain if possible. I posted a thread about persimmon a week or so ago….looks like the same stuff several guys posted photos of. Not saying it definitely is…I have personally never seen any, but the photos the guys were nice enough to post sure did look way too much like it. When you mention the bark that jarred my memory a bit…the bark on a persimmon tree is very distinct. On an older bigger tree like one those boards would have had to come from the bark is dark and it looks like somebody “tiled” the trunk. If you have enough bark left on the boards to tell I would suggest you look up persimmon bark too. Where are you located? I believe that it is sweetgum. 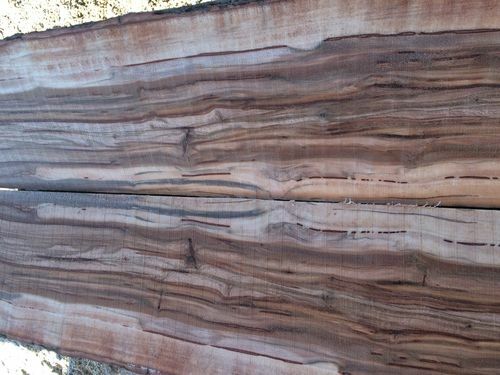 Scroll down about half this page and you will see some sweetgum heartwood pics. BTW, pecan is a hickory and it is ring porous. Sweetgum is diffuse porous. A big difference.